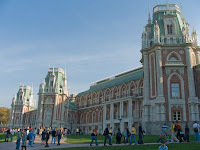 Russian Video: Love is in the Air at the Moscow Tsaritsyno museum! The Tsaritsyno museum hosts lots of brides and grooms everyday. But On September 9, 2009: More than a thousand couples got married at the Tsaritsyno museum in Moscow on that particular day. That is three times the usual daily figure. This entry was posted in Weddings on September 10, 2009 by admin.